When it comes to high quality, affordable sheds, Windsor has proven to be one of the leading manufacturers in the UK. Its range of sheds is impressive and this 10’x8’ overlap apex windowless building is a fine example of the type of quality that has pushed the company to the forefront of the industry. 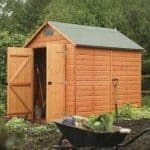 This large shed offers exceptional value for money. What really sets it apart for us is the stylish design. Overlap isn’t well-known for its aesthetic benefits. However, this model defies the stereotype and offers a traditional, attractively rustic building that will really complement the garden. Another thing that separates this model from its competitors is the braced wide opening doors. It’s not very common for overlap sheds to come with braced doors. As the focus is largely on saving money, a ledge design is usually as far as a manufacturer will go. So the fact these wide double doors are braced adds to its overall quality. It is also focused on privacy, which is why you won’t find any windows on this building. 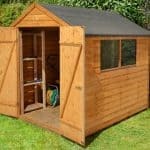 There are a lot of benefits that come with this cost effective shed and the fact it is backed by a 10 year anti-rot guarantee is also impressive. Not suitable for heavyweight storage, though you could make your own improvements such as adding another solid sheet to boost its stability. This is a big, generously spaced storage shed designed with privacy in mind. Benefitting from a tall design thanks to the apex roof, you are able to walk around without restrictions inside the building. Perhaps the most unique measurement of this model is its eaves height. At just 5’1” the eaves are shorter than most sheds. It doesn’t impact the use of the shed, but it does give it a different look, ensuring the doors stand out more. As mentioned, an apex roof is used to provide substantial height inside the building. Both this and the floor are made from solid sheet materials. This is very common in overlap sheds and is largely used because they are cheap to work with. Whilst they don’t provide the strongest support, they are more than adequate and offer great quality at this price range. You can also upgrade the floor yourself if you feel you need to. Just another solid sheet installed on top of the one supplied will make the floor sturdier and more suitable for heavier equipment. Another benefit of the apex roof is that it ensures rainwater will never settle on top of the building. This drastically reduces its risk of rot. To ensure the best quality, traditional style overlap has been used to create the shed. There are a few various types of overlap and traditional square cut is the best quality type offered. The way overlap is installed makes it look a lot like common wooden fences. The panels are nailed on top of one another, creating a tight locking design. It isn’t as draft proof or as waterproof as tongue and groove cladding, but with a high quality treatment it will remain unaffected by the weather for many years to come. That’s why the shed is provided with a 10 year anti-rot guarantee. Unsurprisingly a 28mm x 28mm standard frame is used to support the shed. Treatment requirements are pretty strict with this building if you want to make sure it lasts. A basecoat treatment is added before the timber is shipped out, but this purely protects it throughout shipment. An extra high quality preservative will need to be added once the shed has been built and then continued each year. The braced double doors open out to reveal over 3’ of access into the shed. This lets you easily store bulkier equipment such as lawnmowers without struggling to get them into the building. They are also pretty tall so most people will find they can walk straight in without needing to duck. Turn buttons are also added to stop the doors flying open in strong winds. 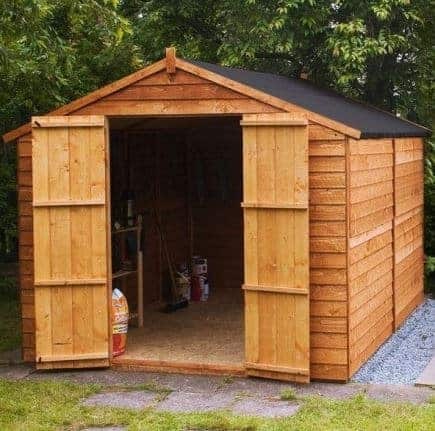 As there aren’t any windows, you won’t get any natural light inside the shed so this is something you need to think about if you want to use it as a hobby shed or workshop. We’d recommend the alternative version of the shed which comes with 4 windows if this is how you plan to use it. The only problem with overlap sheds is that they don’t tend to come with any security. However, it is pretty simple to solve this problem. A hasp and staple secured with a padlock would be the best option here. If you add your own security you can then store more valuable equipment as the windowless design gives the shed ultimate privacy. The lack of security isn’t a massive surprise due to the incredibly low cost of the building. Unusually there aren’t any customisation options available for this shed. However, there are a few extras offered that you might find useful. 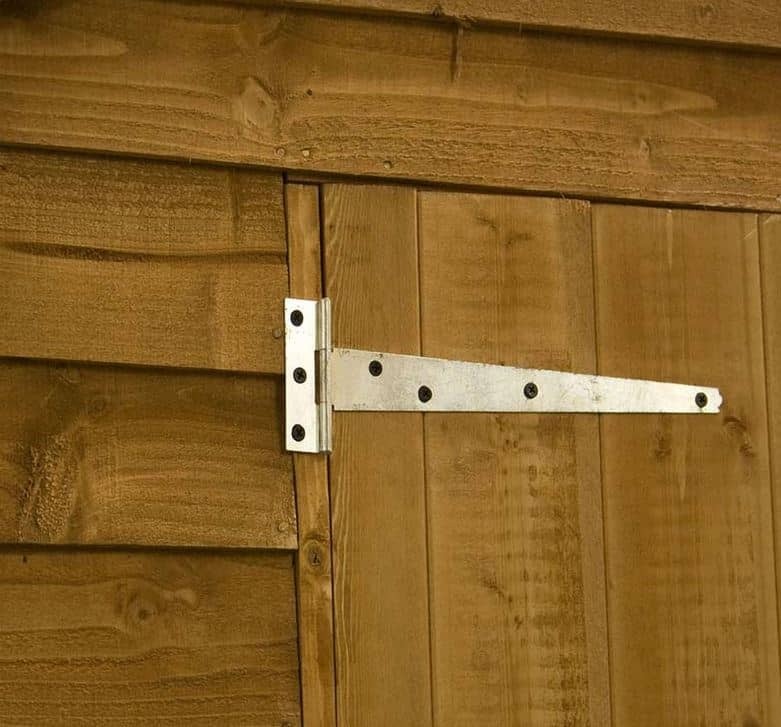 Overlap shed hooks are recommended for those looking to keep the shed more organised. If you’re new to the world of sheds, one of the main things you need to know about overlap cladding is that it will not cope well with having nails hammered into it. So this eliminates the possibility of adding shelving and standard hooks. 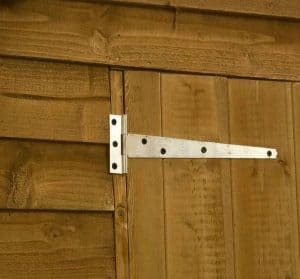 However, overlap shed hooks are specifically designed for this type of cladding, slotting in between the panels without the need for any adhesive, nails or screws. They aren’t strong enough to hold really heavy tools, but they can help keep wires and cables tidier, as well as accommodate lighter gardening tools. Coloured treatments are also ideal for overlap sheds. Whilst we feel this particular overlap shed has a more attractive design than most, you might not agree. If not, a coloured treatment can help you to alter the colour of the building, as well as protecting the timber against the elements. 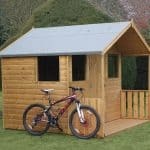 Though it isn’t the best quality shed available, this Windsor model does offer excellent quality considering its cost. It still comes with some pretty good benefits and compared to many similar sheds it does have a better quality design. Even though the quality isn’t as high as stronger tongue and groove sheds, this one still comes with the same 10 year anti-rot guarantee. 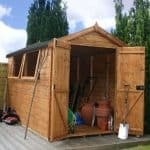 It does require better quality treatments to maintain its longevity but overall this affordable shed should last an impressive amount of time. 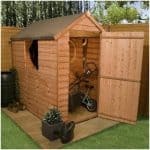 This is a large shed and will therefore hold a large quantity of storage. However, it cannot support the installation of shelving so compared to tongue and groove sheds the storage capacity is slightly lower. One of the main benefits of this shed’s simplistic design is that it is going to be very easy to assemble. The only tricky bit will be the roof due to its height. However, with two people working together even this shouldn’t produce many problems. Sure there are parts of this shed that could be improved, but for what you are paying you really are getting super value for money. 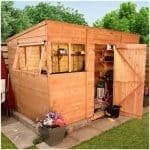 It is one of the most affordable sheds of this size available and should last a long time with regular treatments. Final Thoughts: We’ve reviewed a lot of overlap sheds and this Windsor model is definitely one of our favourites. It comes with so many benefits yet it is offered at a very low price. It is a large, incredibly spacious shed, built from traditional overlap. What’s unique about this model however is the fact that it looks a lot more stylish than its competitors. It is also constructed to a higher quality than a lot of overlap sheds with a good example being the braced, wide-opening double doors. Other benefits include a 10 year anti rot warranty, tall interior and a windowless design.